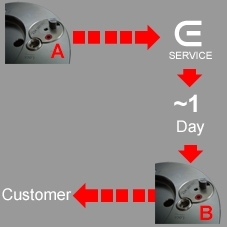 Using the SERVICE STANDARD, the customer sends the worn tool (customer tool) to EURACRYL. After approximately 5 working days, the tool (client tool) is sent back resharpened tool to the customer. EURACRYL, WOLF MACRYL, REICHEL, BERMAQ, AF ACRYL, CODEMA, MALCOMPLAST, CR CLARKE, EFC, MECANUMERIC, KUPER, WEEKE, etc. Using the EXCHANGE SERVICE, the customer sends the worn tool (customer’s tool) to EURACRYL. 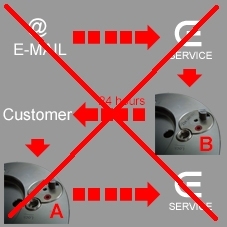 After verifying the customer’s tool, another sharp tool is sent to the customer within a period of 24 hours. The last tool sent to the client passes to his property. 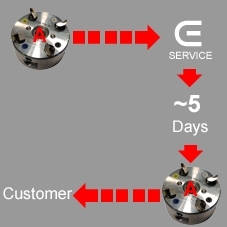 This service is only available for EURACRYL ES type tools.